​Solid stone carved corbels create a simple yet very attractive design, a popular design with versatility to suit most rooms. Shown with, Stoven™ Kensington SE wood burning stove with integral oven, and natural stone chamber. The Barosa fireplace incorporates a matching stone hearth but if your preference is for a honed black granite hearth, we can mix and match to your choice. The Stoven™ Kensington SE wood burning stove shown is unique, as this all new patent pending designed stove incorporates the following features: Separate very large panoramic curved glass panel and door, so you can enjoy watching the fire burn with maximum effect. An integral oven built into the lower part of the stove with separate door, enabling cooking, ideal for cosy nights in around the fire, also a great back up for cooking in emergency situations, if there is mains supply failure. Air wash system to glass. Attractive design. 78.8% efficiency. Clean burn technology. CE approved. Smoke exempt approved, to allow burning in smoke controlled areas. 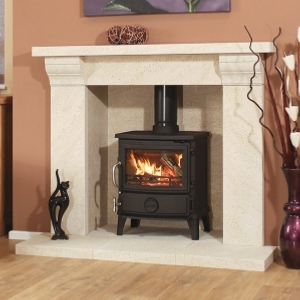 The Stoven™ Kensington SE is shown with the standard legs. Shorter legs are available as an optional extra if there are any height restraints for stove installation. (Please see our stove brochure). Fireplace shown with stone chamber linings also Vermiculite chambers are avalible for this model in the following designs, Herringbone Brick design, Reeded design and Brick Bond design. There is the option to select any of these designs enabling you to mix and match to your choice.